1) The 1951 All Stars "set" of 22 must have included not only all 11 Connie Mack All Stars but also the eight Major League All Stars and by implication the three super short prints! (UPDATE 6/1/13 Keith Olbermann has advised CCC was NOT selling the three short prints). 2) 1952 high numbers were already scarce, going for a buck a pop. 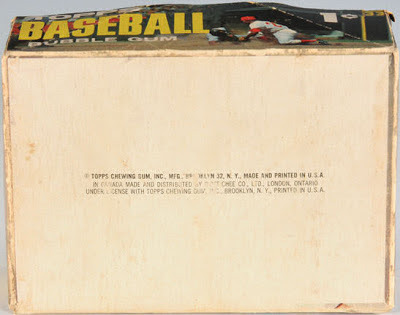 I am trying to reconcile this with the large number allegedly dumped by Topps in 1960 (a story I do not believe anymore). 3) 1956 Baseball Buttons (Pins) could be had at a nickel apiece, although the supply seems thin nine years after issue. 4) There were no full sets of 1964 Baseball Coins available mere months after they had been inserted into the 1964 packs. 5) 1959 Bazooka baseball cards could be had for fifteen cents each (see TOPPS GIANT SIZE in the lower right corner). I wonder if they were still on the box flats? Bowman's, Leaf's, T206's (a whopping forty cents each!) but the Canadian cards, including some Parkhursts are an eye opener. Topps Hockey would have entered the US hobby this way. And Woody selling Fleer cards while Topps was locked in a huge court battle with them is downright bizarre. Plus, more Bazooka! Not sure what the Baseball Card Check List was-possibly Charles Bray's American Book of Checklists? (UPDATE 6/1/13/: Keith Olbermann has also advised this was Woody's own bare bones checklist). All sorts of goodies here from primeval card storgae to ACC's to Basketball cards from Topps and Bowman. You can almost hear the anguished cries of old school hobbyists needing proper storage ringing out. Given the treasure trove of information here, if any readers have good scans of other CCC catalog, please send them along for a future installment. Back in 2012 I had an article appear in The Wrapper #265 that compared the vastly similar Space Cards and Target: Moon issues and attempted to date each set as the conventional hobby wisdom had them both coming out at the same time in 1957 or '58. 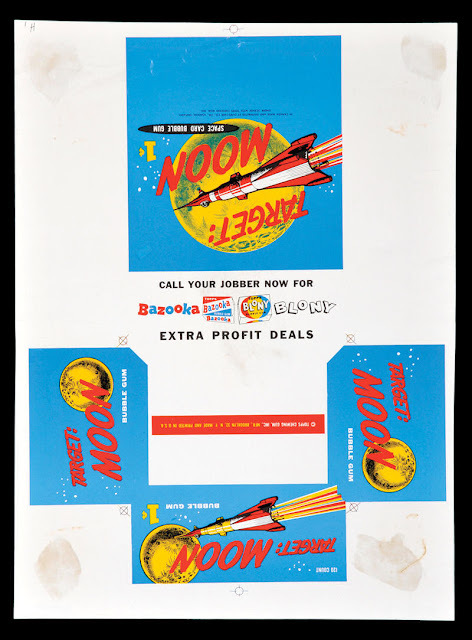 I was able to determine Space Cards had been issued in 1957 and Target: Moon (the blue backed edition) had come out sometime after mid-1958 due to differences in the Bazooka advertising on the wrappers. My conclusion on Target: Moon was that is had likely been issued in 1962 but that there was a possible date range of mid-1958 to mid-1963. I won't bore you with the details but you can read all about it here. I'll flip it around so you can read it but the red copyright strip on what would be the box bottom is a big clue as to possible time frame, as is the inclusion of a Blony "hint" on the back panel. 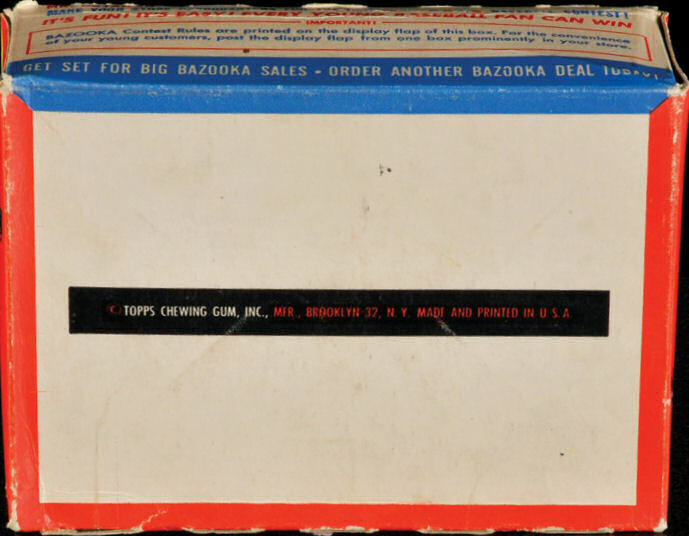 The first thing to notice though is that the Bazooka gum tab shown states "Topps" and not "The Atom" on the red triangle portion, which confirms the mid 1958 or later date of issue. Not all issues follow these patterns. There is a 1961 Baseball box with no color bar and no "32" and some 1964 Baseball boxes have no indicia on the bottom at all (possibly due to the ZIP code changeover) and to further confuse things a 1965 Outer Limits box still has the "32" plus a PO Box number as it identifies Topps alter-ego Bubbles, Inc. but I think you get my drift; the color bar disappears in 1963, so Target: Moon would have been issued before then. The "32" slowly faded away and a Brooklyn, N.Y. address without it or a ZIP code followed. Around the time of the move to Duryea in 1966 a 11232 ZIP code came into play until Brooklyn itself was banished in mid-1969 as Topps abandoned their roots for good. Now what about that furshlugginer Blony ad? 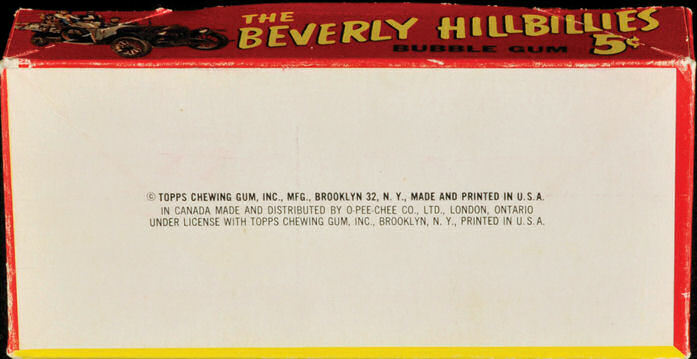 As we know, Topps acquired the brand when it bought Bowman in 1956. I don't know when Blony ads featuring the "rainbow" bubble shown on the Target: Moon box started showing up in earnest once Topps redesigned that brand's wrapper so that's no help, although it was identified as a "twin" pack (2 pieces) in some 1957 product ads (the rainbow pack is not a twin pack I don't think). Blony continued on, spasmodically, into the 1970's but underwent another redesign in 1969. As of now, I am wavering on my 1962 estimated issue date for Target: Moon and hoping to develop a little more information on the Blony graphics to nail the date down better. 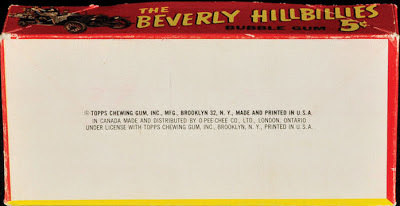 Jeff Shepherd has a huge amount of his collection featured in a new book about Bazooka Joe (go buy it-trust me) and he has some dating on Blony wrappers I want to think about and discuss with him. As always, readers thoughts are appreciated. I'll be incorporating Bob's source material into version 2.0 of the Modern Hobby Guide, which is presently being worked upon but there is some really good information in Bob's recent posts that I think would fascinate readers here. So this leads to an interesting question, namely, why would there be 89 examples of one specimen in such nice shape? BFF o'the Archive, Jeff Shepherd, thought they may have been salesman's samples, intended for stapling to letters sent out by the sales team at Topps and I suspect he may be right. 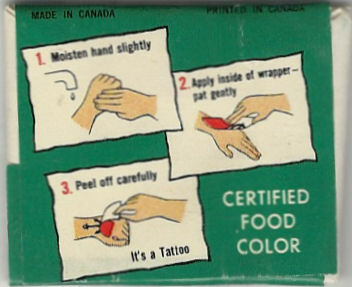 It makes me wonder if most unripped Tatoo wrappers, no matter what the year, were intended as samples. It also makes me wonder how these were produced. 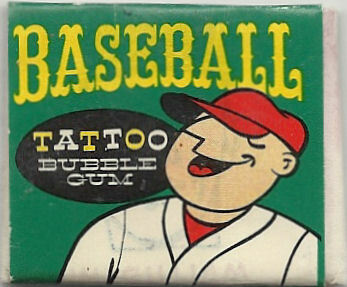 Most Topps tatoo (and similar) issues through the late 1960's were printed as rolls with alternating subjects. 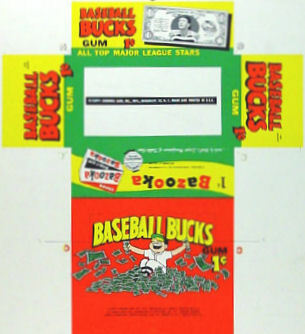 While this was the first Topps novelty product, I have to doubt they were so inept as to group so may subjects together and admit I am a bit stumped as to the process that would result in such a hoard. Will a similar hoard of dinosaurs be next? Hard to say since Atlas examples outnumber them from what I have observed. I'm pretty sure I know who won the auction and hope to have some hi-resolution scans at some point. Now, can you imagine what a nicer wrapper or pack like the US and Canadian examples shown above would bring? !